I have a full schedule for the next few weekends with everything from basic OCF to multi-light and glamour and my next workshop is this Saturday in Delaware. Join in the fun if you are in the Delaware area! Today we’ll take a quick look at adding gels to your work. This year I decided to add more color to my work using gels. Gels can color correct, like turning daylight flash/strobe to tungsten, or just coloring the light to change a background from grey to green or cool to warm. For this post, I added contrast and color by adding a Rosco Blue Gel to my fill light. I wanted to add color tone and contrast to an image and added it all with just a hint of fill light. As this was shot on location and was a workshop, the triggers are Phottix Ares so all cameras in attendance could participate. I attached my Indra to a Matthews shorty C-Stand and used a Manfrotto Super Clamp to attach the Tri Grip Reflector lower to the light source, creating a nice bounce fill light on Megan. The light is soft and fills in all the shadows with just a touch of contrast and color. Once I added the fill light, all the shadows opened and the exposure evened out across the frame. And here are finals that went through a full round of retouching and finishing, although the model does not need that much work! Once the images have been finished, you can really see how the blue-toned light from below added fill and contrast to the finals. So add gels for creative effect and to add dimension, drama, and contrast to your work to keep it exciting and fresh. That’s it for now. Till next time, are you gellin’? I want to list my upcoming workshops for the next few weeks here so you have them and can see if you can attend. I have a full schedule for the next few weekends with everything from basic OCF to multi-light and glamour. We’ll work all OCF and shoot from 1-4 speed lights for creative looks. Space is limited as this is private workshop where you’ll get more personal instruction and advanced looks, going from commercial, to fashion, to glamour with multiple lights and gear. Learn techniques for shooting in natural light. Let me show you how you can use simple reflectors to modify your light and add sparkle to those dimly lit eyes. The last time I went to Berger I brought a set with me, this time is no different: I’m building a really cool set to shoot high end, multi-light, glamour in several configurations. This is a great workshop series! With many different looks and ideas to update your portfolio and learn new technique. 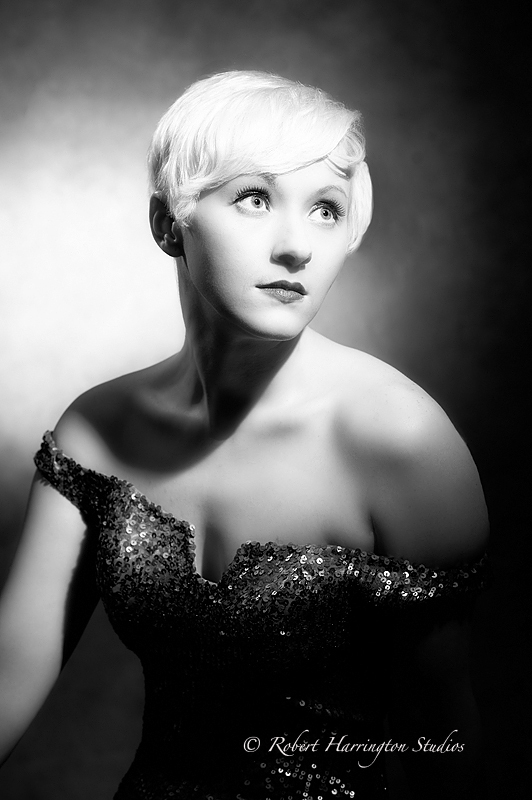 One of my signature looks is the 40’s Hollywood Glamour Portrait. I developed this look using speed lights and Rogue Flashbenders a few years ago and use it in my professional work and teach it extensively. One of the most enduring and uniquely American photography styles is the 40’s Hollywood Glamour shot. The key to the look is hard direct light with the commonplace shadows of the time: Loop Light, Paramount Light, Rembrandt Light. The other commonplace look is a 3 light setup: Key, Hair, Back. In my initial setup, I set all my flashes to Manual Mode and 1/4 power. I test shoot my exposure and then adjust each light to taste. Normally, my key is set to 1/16 power and the hair and back remain at 1/4 power, but each person is different so this is just a start point. My exposure is 1/200 @ f/5.6 or thereabouts. I try to stay to 5.6 for enough detail in the face but still have the back go out of focus. Speed lights don’t have modeling lights and any model light feature on any trigger really doesn’t give you enough light to work with, but this is the beauty of shooting this way: you don’t know what you are getting till you shoot. I like the mystery here. Always set your exposure in color to view and check for clipped highlights. Black and white captures don’t show all of the file information and my may clip highlights in b/w without realizing it. Then I swap to b/w in the camera. The look is all about shadow and tone, so why not shoot it in b/w? After I’ve gotten exposure and light setup done, I shoot. I try to shoot multiple looks and move around my light setup so the light hits my model in different locations and changes the look on her face without changing the light position. Then I head to Photoshop where I clean the photo, remove stray hair, blemishes, etc, sharpen it selectively, and then apply a light Glamour Glow, all still while in color. Notice the Paramount or Butterfly light under her nose: perfect! Once I’m satisfied with the overall look and feel in color, I swap to b/w. I have been using actions for this and love either Totally Rad Bitchen B/W or Kevin Kubota the New Black and White. However, a simple b/w desaturation and add a bit of contrast and a vignette and the effect is the same. Kat has that dreamy, alluring, faraway look of the Glamour portrait, as if Kirk Douglas or Montgomery Clift were waiting for her offstage. This is the most fun look I teach and use professionally. You simply must try it! Be forewarned, it is not an easy setup so don’t get discouraged, just shoot it and have fun! Many thanks to my model Kat for being so great! 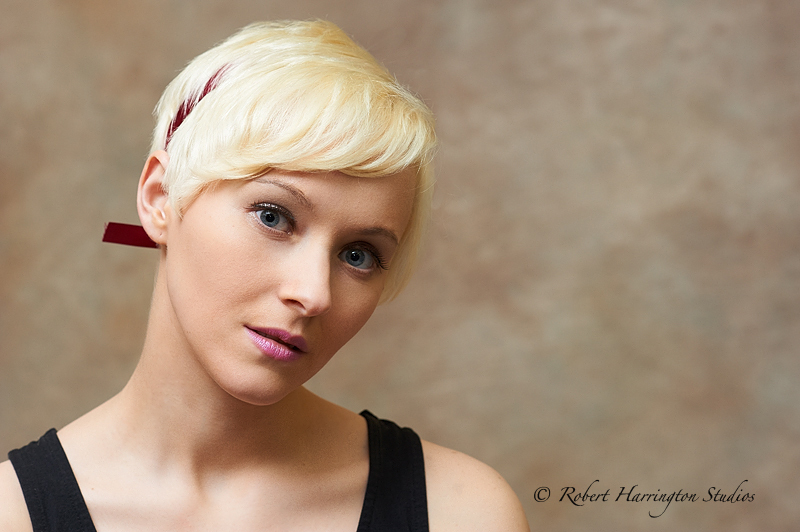 This past weekend I traveled to The Photo Center in Brocktown, NJ to run a small flash workshop. If you were there, it was a great and fun event! Bounce Flash, Umbrella, Over and Under, and of course 40’s Hollywood Glamour. We used single light sources until the 3 light Hollywood Glamour. I’ll have a full post on that style of light tomorrow. Many thanks to Jeff and the crew at the Photo Center and Kat our model. And finally we shot my absolute favorite: 40’s Hollywood Glamour using 3 speed lights and a complement of Rogue Flashbenders. I’ll have a fuller post tomorrow. If you are a speed lighter and want to learn these techniques, join in the fun in Delaware or anywhere else you find me. I’m always teaching around the country. Till I meet you in person, happy shooting!! The last few posts have been on the ongoing saga of a location change for my two upcoming workshops. If you are in the Central New Jersey area or near Newark, Delaware, I’m coming your way! Both days I’ll be running my popular “One Speedlight, 16 Looks” event. 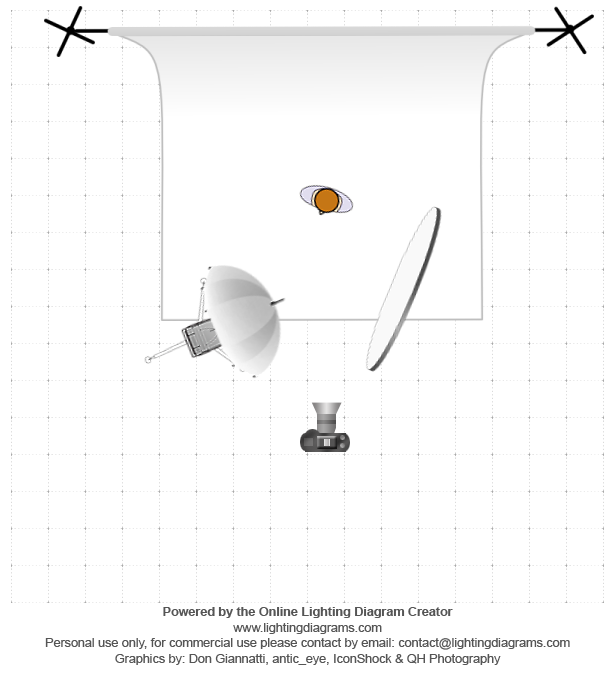 Want to learn new and creative ways to use just one light source, then join in the fun! Don’t hesitate, register for the event in your neighborhood and let’s get shooting. 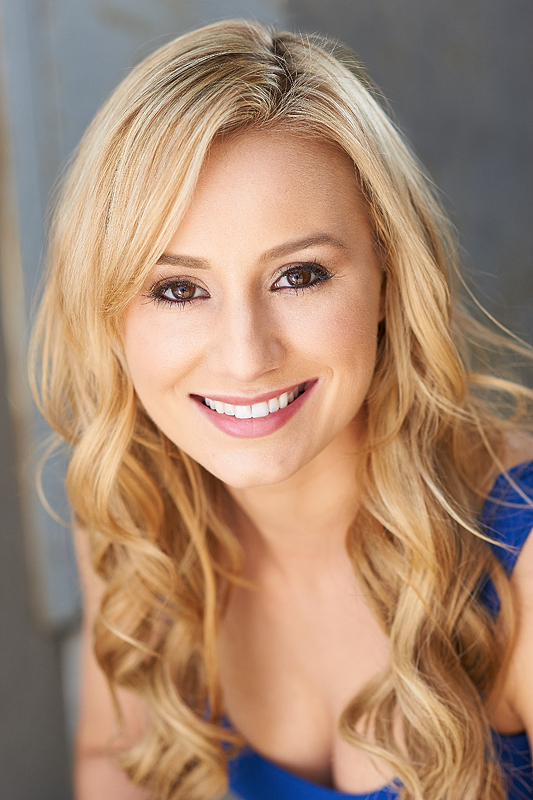 Build that portfolio and learn new technique just as the Spring headshot and wedding season is heating up. First, let me say a belated Happy Easter and Passover. I was ill before the holiday weekend and am now just getting back to it. The location for the workshop in NJ this Saturday has been changed. If you are attending the Photo Center workshop “One Speedlight, 16 Looks” we will be at the Photo Center and not Salt Studios. Depending on how the store is setup, we may modify the workshop and also work outside for a bit. Any questions, call the store at the above number. This is part 2 of my 3 part Portrait lighting post. Part 3 will be here probably next week when the images are back from my retoucher. 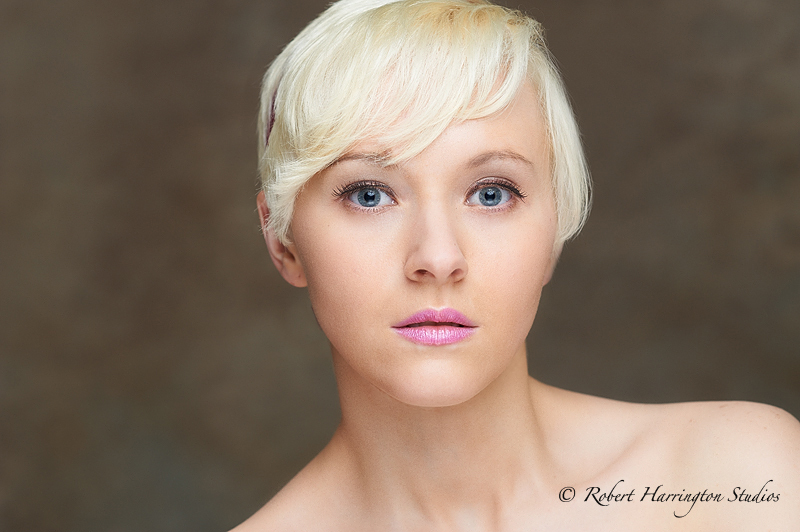 Part 2 is about the second half of my lighting workshop with Milford Photo and Phottix last Saturday. During the second half of the day, we went to lighting with multiple lights, mixing speed lights with the new Phottix Indra 500 moonlight. In this first image, we did a simple two light commercial high key shot. I put Megan right up against a white background and used one light high and above and one light below for fill. After this shot, we moved quickly to something more complicated. I chose to use my lights more creatively this time, so my key and fill lights are all small so I can isolate parts of the image and keep light off of the background. 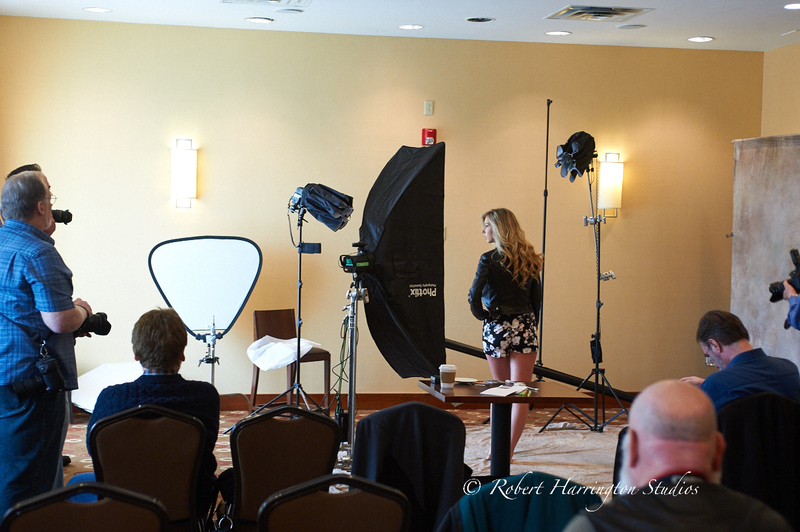 Next, I was asked by an attendee to show how to mix natural light with modified light and make it look natural. Our key light in this initial shot is just the diffused light coming in from the window. Notice how the right side of the frame is dark. To open the shadows on the right up and keep it natural looking, I simply bounced a speed light into the ceiling to add fill around the entire image. This was a quick adjustment at the end of the session, with a bit more time I would have dialed-in exposure. But this is a good example of adding light by just bouncing it around the room. 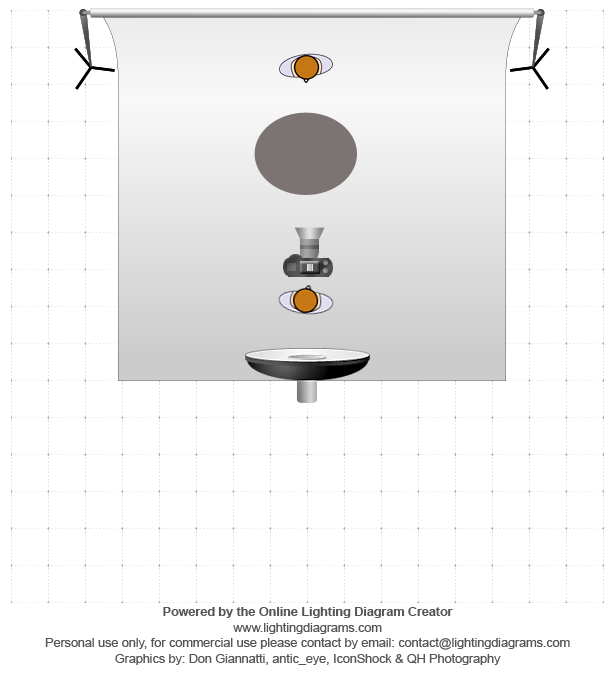 Here is a diagram of the setup. I had set the speed light to manual mode at 1/2 power to illuminate the room behind Megan. Well that’s it for today. 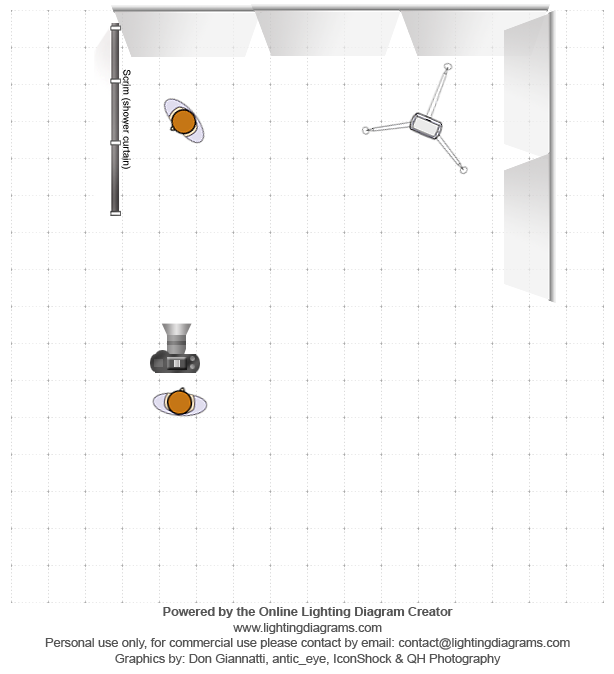 Take a look at the images and diagrams to add this kind of work to your lighting. Getting creative can be as simple as bouncing light around the room or collapsing your modifier over your light. Why buy expensive modifiers when you may already own what you need. For today, I’m posting on an event I ran with Milford Photo and Phottix. This was a dual event with speed lights and the new Indra 500 moonlight. The workshop was split into two sessions. The morning session was basic speed lighting only using one light and a reflector. The second session and the topic of tomorrow’s post, part 2, is from the afternoon session using more advanced techniques. Part 3 will arrive next week when images are back from the retoucher. 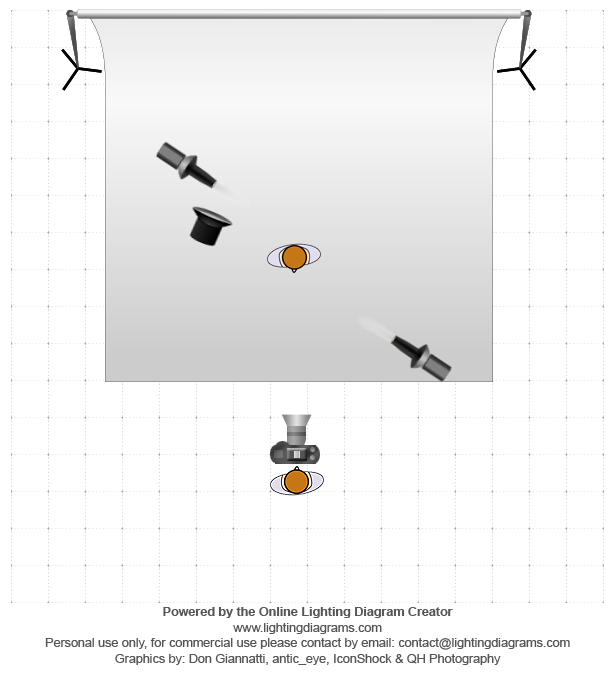 So for Part 1, we’ll take a look at simple one light setups. I usually take a BTS shot, but the action was fast and the crowd inquisitive, so I forgot to take them; however, I’m adding diagrams for you. 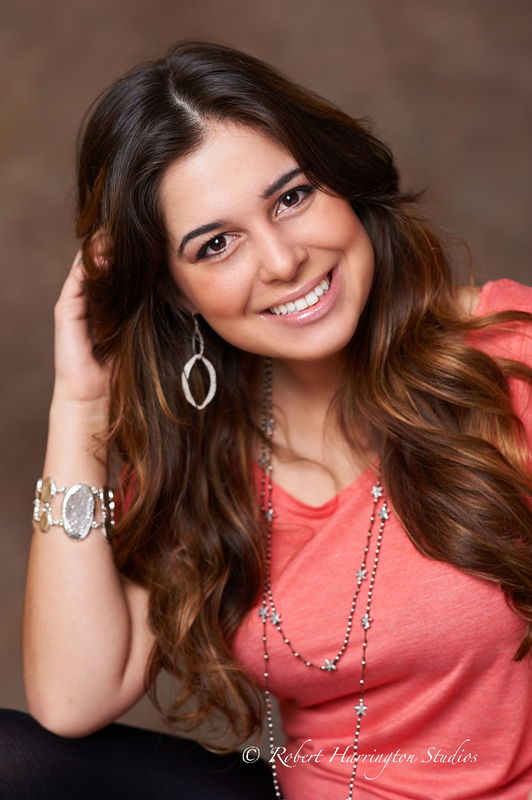 Our first look with our model Alyssa, is a basic one light portrait on a simple muslin backdrop. I lit Alyssa in the typical one light format: key on 45 x 45 axis to the subject and Lastolite Tri Grip reflector on a light stand. After all the attendees went through the station and shot frames with this look, I quickly changed to a modified Over and Under Beauty or Clamshell setup. One way of shooting the over and under look and a way that I use a great deal is to put yourself in between the key light and the subject. In other words, the light is actually behind you. When shooting this look, you need to pay attention to exposure, especially with speed lights. With a moonlight, you have enough power to keep exposure at a reasonable setting, like 1/200 @ f/5.6, ISO 200. With a speed light, you’ll need to adjust aperture and ISO to account for the limited power of the flash. I did basic retouches on these images. The finals are out to true retouching. 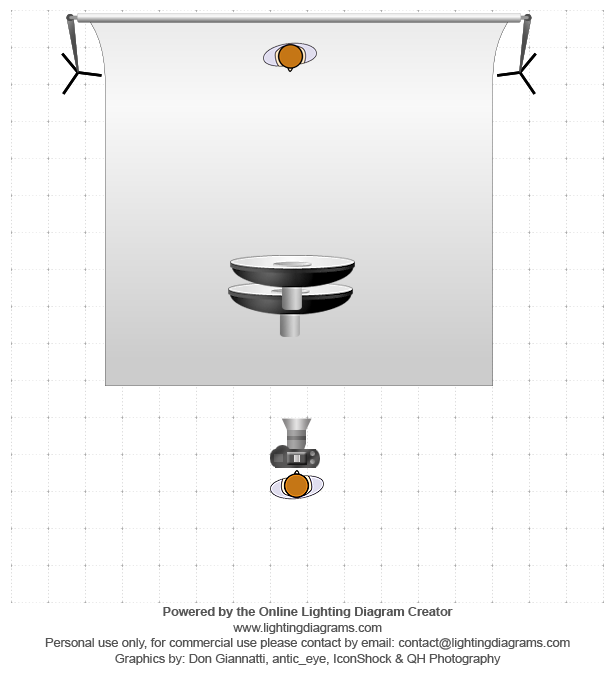 Part 2 tomorrow will show you different setups using multiple lights and mixing flash with strobe/monolight. Thanks for stopping by! Till next time, happy Spring!